A few weeks ago I was able to try JinJoo’s latest promotion with fellow foodies at their The Podium Mall branch. With this promotion Jin Joo is offering UNLI KBBQ featuring USDA Prime meats priced at Php499 for lunch and Php 549 for dinner. Enjoy our 10 kinds of quality beef, pork and chicken, plus unlimited kimbap and cheese dip. You can also get a FREE 1.5 Coke for every groups of 4.This current promo is only available at their Eastwood and The Podium branches. The 10 flavors included in the UNLI K-BBQ promo includes: Unmarinated Samgyupsal, Dan Samgyup, Gochujang Samgyup, Cajun Samgyup, Yalb-Eun Sam, Daweji Ggudaegi, Unmarinated Woosamgyup, Dan Woosamgyup, Cajun Woosamgyup and Dak Galbi. You enjoy the unlimited meats for 2 hours. The order quantity provisions are as follows: You can order maximum 2 kinds of meat for 4 full paying adults; you can order maximum 3 kinds of meat for more than 4 full paying adults; and after you’ve finished eating those meats, you can order again. Children 3 feet and below are free while children 4 feet will be charged half of the price. If you have leftovers, penalty of leftover is Php 200 for leftover meat per pax. Left over or side dishes are not allowed to be taken out. Besides the meats included in the unli promo, we also got to try Jin Joo's 8 Flavours where they use naturally-derived food coloring for our marinades. The 8 flavors are: Honey garlic, wine, herb, curry, soybean, red pepper, nutty, smokey bbq. Other dishes that we got to try are their ban chans, Buddae Jjigae, Haemul Panjeons and the Cheese Dung Galbi which is their fall-off-the-bone BBQ baby back ribs with mozzarella cheese, corn, and steamed and a must try! 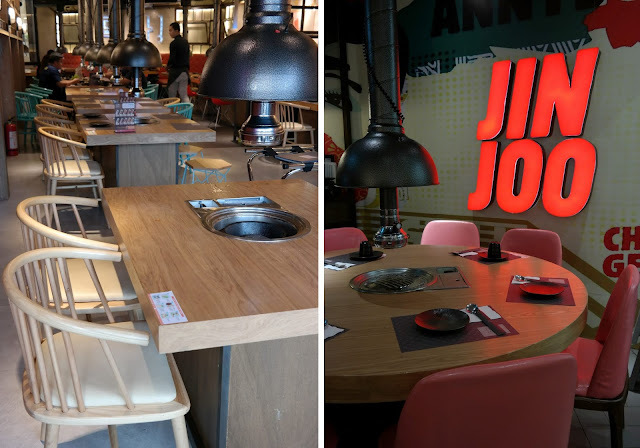 I love their meats and all the other stuff that Jin Joo offers. I just find the cheese dip a bit sweet to my liking but still good when paired with any meat wrapped in lettuce. Ambiance is pretty hip with those murals and neon signs. One thing that I see that they need a major improvement on is the service.